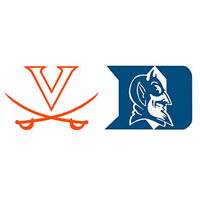 Second-ranked UVA led by as many as 11 points in the second half, but Duke closed the game on an 11-0 run, hitting its last six shots from the field, and stunned the Cavs, 69-63, before a raucous sellout crowd at the John Paul Jones Arena in Charlottesville, Va. It was the first loss for Virginia (19-1, 7-1 ACC) in 2014-2015, and ended a 21-game home winning streak on a big day on Grounds for the UVA program, which hosted ESPN College GameDay for the first time in school history, and led most of the second half. But Duke (18-3, 5-3 ACC), off to its worst start in ACC play in 20 years, got up off the canvas late. After an Anthony Gill layup capped a 7-0 UVA run that gave the ‘Hoos a 56-47 lead with 5:19 to go, Duke went scorching hot, scoring on its last eight possessions of the game from that point on. Virginia went punch-for-punch with the Blue Devils for the first part of the onslaught, and still led 63-58 with 2:59 to go on an alley-oop dunk by Justin Anderson on an assist from London Perrantes. But those would be the Cavs’ last points on the night. Virginia went 0-for-4 from the field with a turnover and a missed free throw in the final 2:59. Duke made five of its last six shots from three-point range after starting 1-of-11 from behind the arc. The Blue Devils shot 50.9 percent from the field for the game, the first Virginia opponent to shoot above 50 percent this season. UVA shot 41.3 percent (26-of-63) for the game, 50 percent (15-of-30) in the second half. Brogdon led the Cavs with 17 points and six rebounds. Justin Anderson had 11 points and five boards, and Perrantes contributed seven points and five assists. Tyus Jones had 17 points, four rebounds and four assists to lead Duke, which also got 15 points each from Justise Winslow and Quinn Cook.